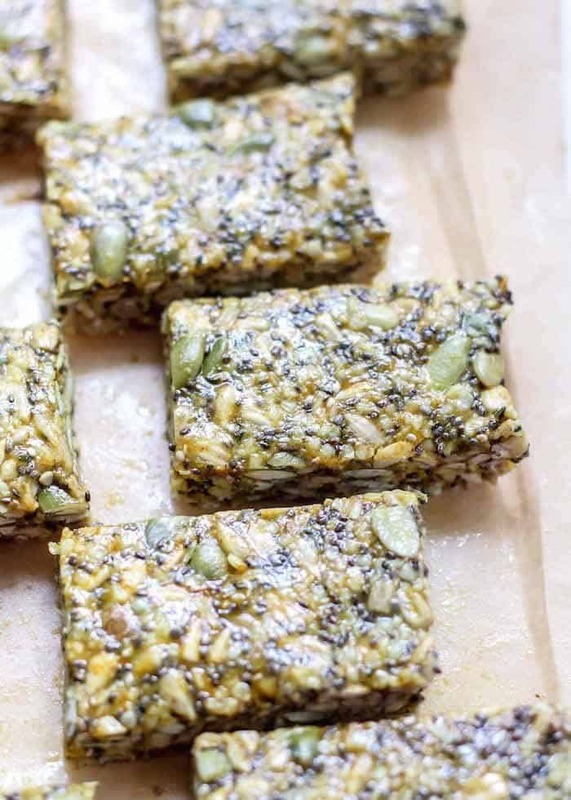 Lots of healthy fats packed into these no-bake Cinnamon Turmeric Super Seed Energy Bars. 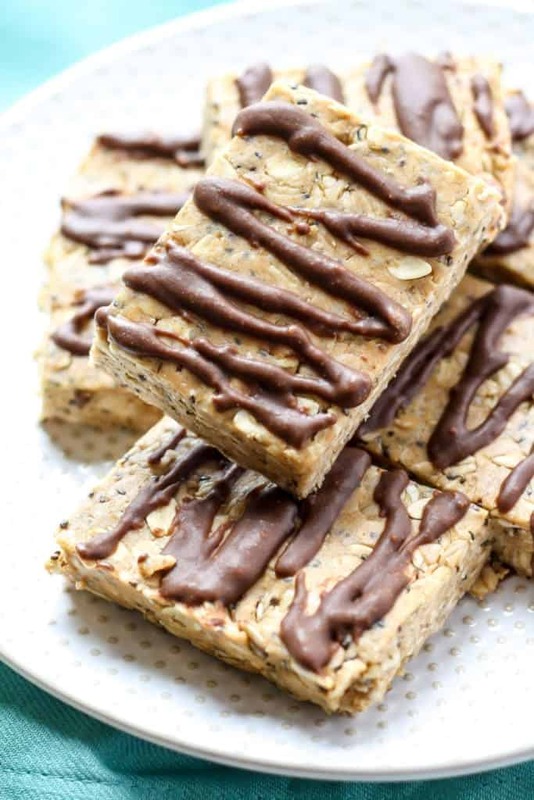 Lower carb, and only 5 grams of sugar per bar! Vegan, gluten-free and nut-free friendly. Guys, can I just say how happy I am to be here today? I had a pretty great weekend of recipe testing and planning out these next couple weeks and I am just so excited about these next few recipes I have to share. I’ve managed to have the first productive day in quite some time and it feels SO good. Of course my house is still a mess and my kitchen is a COMPLETE disaster at the moment (always…?) … But little wins, my friends… little wins. Plus a part of me kind of wants to leave the kitchen the way it is and show Drew what he misses when he’s not home 😀 Okay, fine… I could also use some help. Anyways, I’m also pretty pumped about these super seed energy bars. Why? Because seeds are awesome, and I feel like they are often forgotten about. Nuts get all the glory. Don’t get me wrong, we all know how I feel about nuts (AKA butters)… But seeds get overlooked sometimes. So I thought it was time we dedicate an entire bar recipe to them. Basically seeds are freaking awesome. 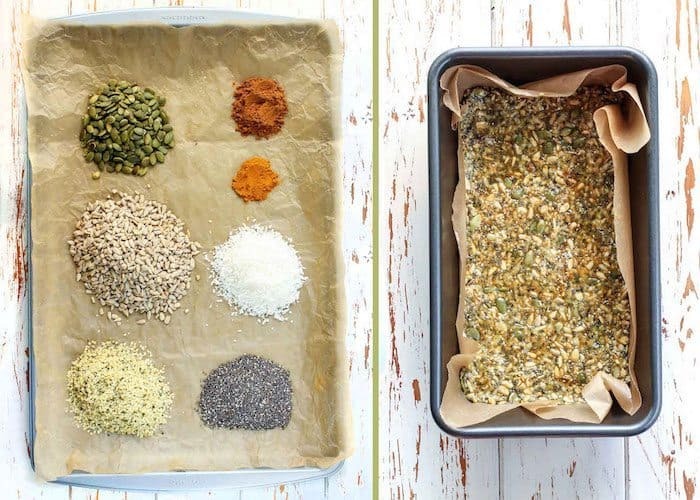 Once you combine all of your seeds and spices in a bowl, the only thing left to add is a little bit of brown rice syrup, some nut butter, and coconut oil to help hold the bars together. 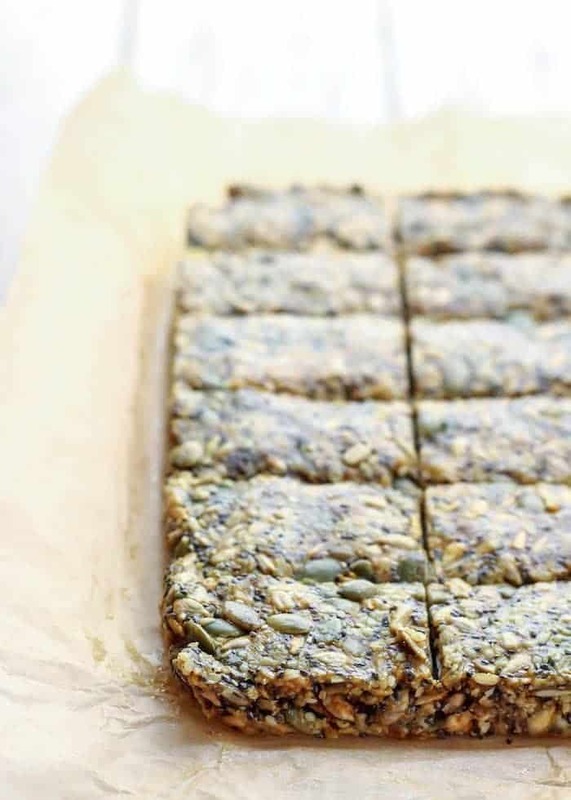 Giving seeds their time to shine in these super seed energy bars. Line a 9×5 loaf pan or 8×8 pan with parchment paper, set aside. In a large bowl stir together sunflower seeds, hemp hearts, pepitas, shredded coconut, cinnamon, and turmeric. Add in nut/seed butter, brown rice syrup, melted coconut oil and vanilla extract. Use a large sturdy spatula to combine. Transfer mixture to prepared pan and press evenly into corners. Refrigerate pan for 20 minutes or freeze for 10 minutes. Lift parchment out of pan and set on cutting board. Using a large sharp knife, cut bars into 12 squares (or 16 for smaller servings). Wrap bars individually for easy grab-n-go, or store in container. Bars keep best in fridge. Enjoy! –Estimated Nutrition based on 12 servings. 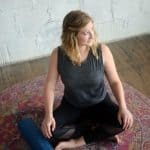 Need a kid-friendly idea? Try removing the turmeric spice and adding a layer of melted chocolate! 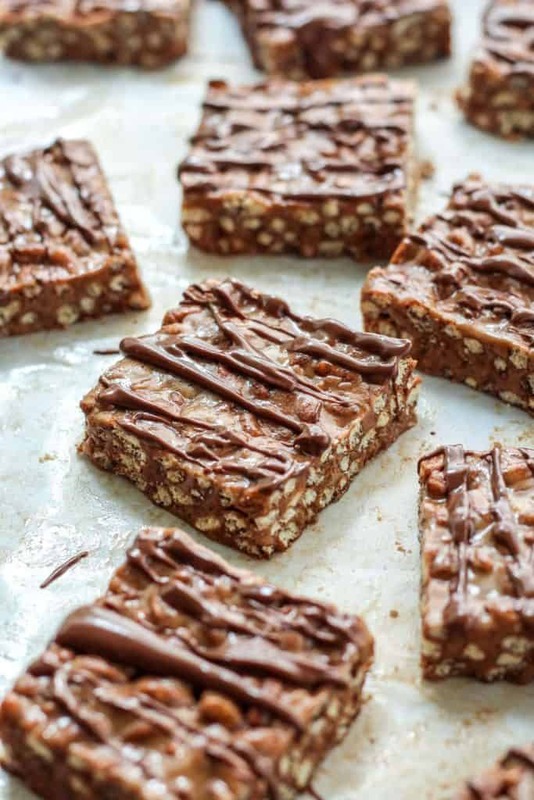 looking for more no-bake bars? I agree that seeds tend to get overlooked, so I’m loooving these, and YAY for having a successful weekend of recipe development (seriously one of my favorite feelings). OHHHHH I actually may be a seed girl. But peanut butter…IDK! I’m in love with pumpkin seeds, I have them almost every day! 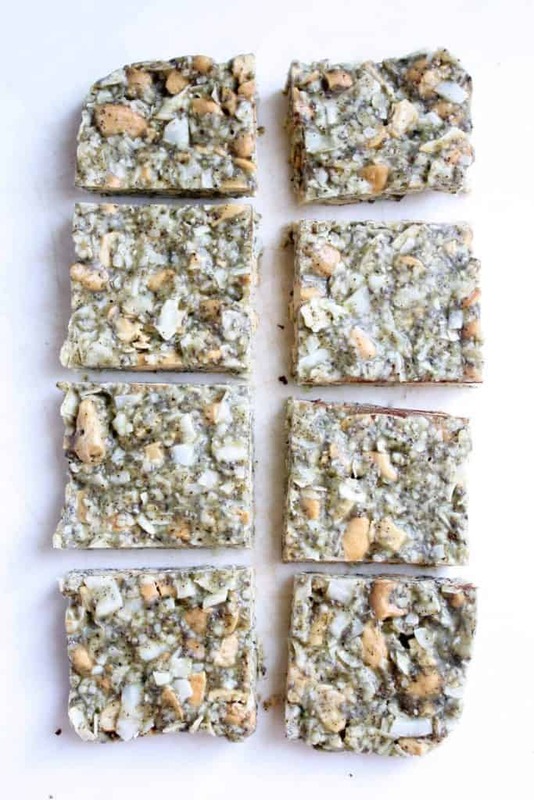 I feel like with the turmeric and healthy fats, these would be perfect stomach soothers! This is fantastic! And I feel ya on the messy kitchen…we don’t have a dishwasher (besides my boyfriend with his rubber duck yellow gloves). Nuff said. SUPER duper seedy! I love all seeds <3 Combining them all sounds like one delicious chewy bar! Yum! 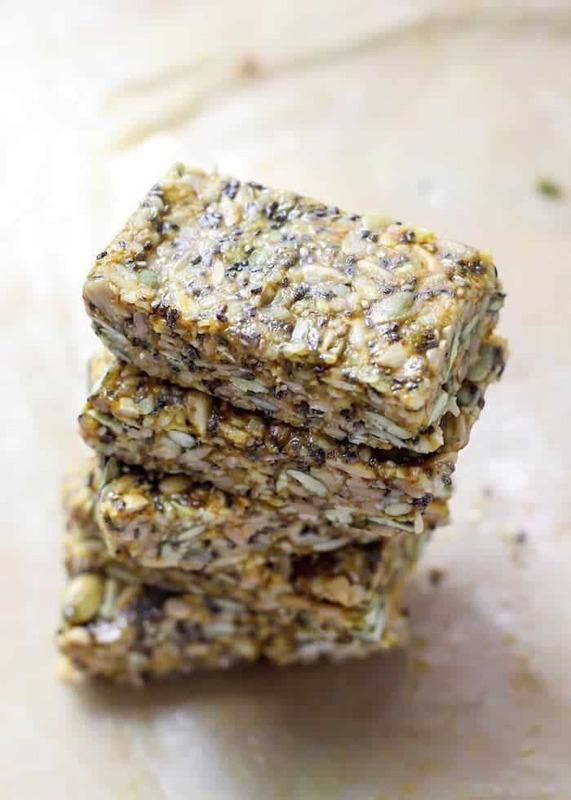 SEEDY bars are my favorite. I love how you made them all into such a pretty looking bar. Now I just need some pumpkin seeds, hemp hearts, and chia seeds? I can’t wait to try these. I think I need to make more of my energy bars. 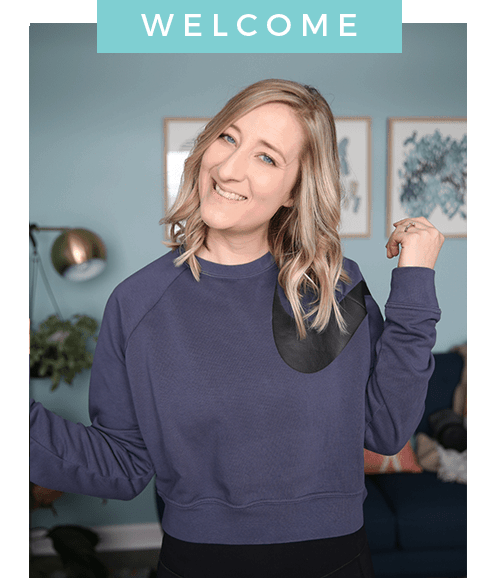 How much do you make your own and do you buy your own Ashley? They could also be made into balls if you’re feeling that route! But let’s see… typically I make them myself probably 75% of the time? It depends on if I am traveling or what kind of trips I have planned. But more often than not I like to make my own. Typically costs less and you don’t have to worry about added junk or even higher sugar in some of the “better” brands. I’m so happy you had a great weekend! Little things make me so happy too 🙂 anyways, I LOVE LOVE seeds, especially sesame seeds! 😀 Cinnamon and turmeric also complement each other so well! These bars look stunning! Ooo i am totally a seed fan haha. I put them in my smoothie bowls everyyyy morning, and always top my salads with them. Can’t wait to try these!! 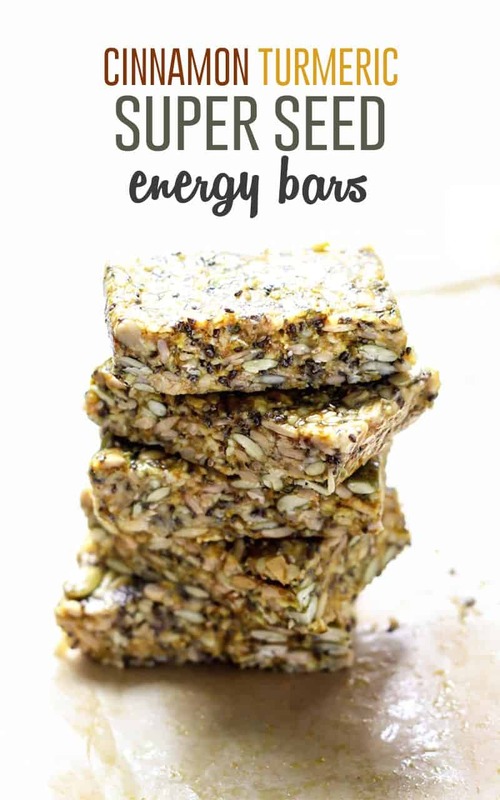 What a brilliant idea to add turmeric to the bars! SO delicious! If I were to add protein powder to this – what would you recommend I switch out or modify? I agree these look and sound great, but can anyone who has actually made them comment on how they taste and how they affected your digestive system and energy level? Thank you! Should I soak the chia seeds first? What a waste of good ingredients. This recipe doesn’t bind at all. Hi Diane, sorry this recipe didn’t work out for you! I’ve made it several times with no issues as have other readers. Not sure what could have happened unless your honey wasn’t very thick and sticky.